Nicole Lynn opened with the story of a young girl. A girl from Tulsa, Okla., who grew up in poverty; who often didn’t know where her next meal would come from; for whom the donation of a winter coat meant the world. It was also the story of a girl who faced challenges head-on; who strove to exceed expectations; who built lasting relationships that helped to define her. It was a deeply personal story, and one Lynn hoped could help inspire the those who gathered for the All-Employee Welcome Back meeting held in Taylor Performing Arts Center the Friday before the semester started. It was a chance for Missouri Southern’s faculty and staff to hear campus updates from administration before Lynn offered her inspirational message. A graduate of the University of Oklahoma, Lynn worked as a financial analyst on Wall Street before becoming one of the youngest female sports agents in the industry. She signed her first client at age 26 and has represented players from the Denver Broncos, Oakland Raiders, and Washington Redskins. As someone for whom the “education system was a way up out of poverty,” Lynn’s story was one well-suited to share in a higher-education setting. Faculty members, she said, have the opportunity to change the trajectory of their students’ lives. 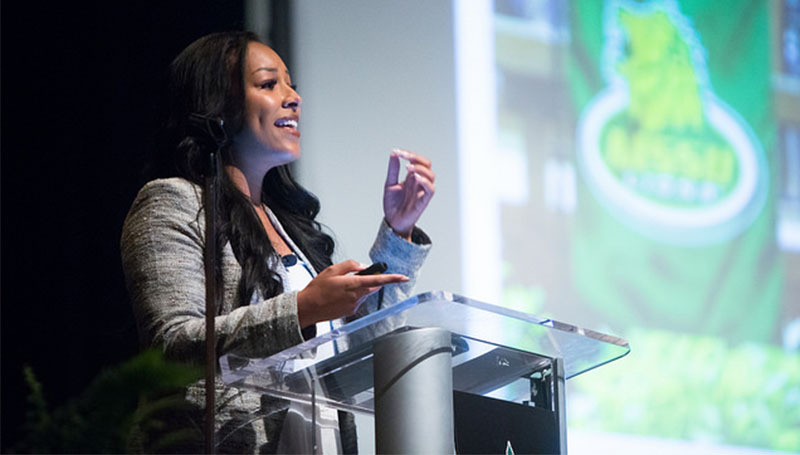 Her presentation to campus focused on three points: never count anyone out; be empathetic and build relationships; and be mindful that the small things can make a big difference. “I had some professors – and even high-school and elementary teachers – who were very instrumental in my growth as a person,” she said. “They were my safe-haven and went above and beyond for someone who didn’t have traditional parents.